If you bought a home before the bubble burst, you may find that you owe more money than what your home is currently worth. This is a very frustrating situation because you owe money that you may never gain back as the equity in your home rises. It can be especially difficult if you find yourself in a position where you need to sell your home, but you will not get enough from a sale to cover the remainder of the mortgage. If you took out an FHA loan, you may not have any real equity in your home, which makes it difficult to sell in the future. Additionally, if you took out a home equity line for home repairs, you may be even worse off with two loans tied to your home. Learn four questions you should ask yourself if you find yourself underwater on your mortgage. Will You Have Time to Let The Market Recover? First, you need to consider your current situation and whether or not you need to worry about the fact that you owe more than your home is currently worth. If you are in a situation where you can continue to live in your home, and you can continue to afford your monthly payments, then it would be best if you just waited out the current situation. This means that you will not move, and eventually your mortgage will equal the value of the home. This will happen in two ways; your current payments will reduce the amount you owe, while at the same time. The value of your home should recover and begin to rise. While this may happen, your home may take several years to reach the value of what you originally paid for it. 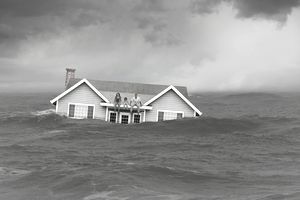 If you are in the situation it is best to look at the long-term picture and realize that you will not always be underwater on your mortgage. Are You Having a Hard Time Making Your Payments? If you are in a situation where you can no longer afford the payments on your home, you will need to take a different approach to the situation. The first thing you need to do is to see if you qualify for one of the refinancing options available through your mortgage company. Many mortgage companies are reluctant to refinance if they see you owe more than your home is worth. However, the government has set up programs that you may qualify for that will make it easier to refinance. While you cannot just erase the amount that you owe, you can get a better interest rate and rework the loan so that you can afford your monthly payment. Be sure that you find a loan with a fixed APR to prevent the interest rate from rising and increasing your monthly payment. If you are in a situation where you need to sell, because you are moving or because you will not be able to afford the home, even with a restructured payment, then you need to consider your options. The first is to consider a short sale on the home. This is where you work with the bank to accept less money than the loan is worth in order to sell the home. Many banks will work with you if you are already behind on payments or if you are close to going into foreclosure. Some banks will forgive the difference between the selling price and the amount you owe. Others may want you to agree to pay the difference by taking out an unsecured loan. It is important to consider the alternatives to foreclosure, especially if you can't sell your home right now. Another option is to go into foreclosure. This means that you simply walk away from the home and turn it over to the bank. If you miss payments, then the bank may put you into foreclosure automatically. You can also contact your bank and let them know that you are giving up the home. The bank may come after you and request that you pay the difference in what they sold the home for and what you owed on the mortgage. This option will hurt your credit the most, and should be a last resort, be sure that you consider all alternatives to foreclosure. Even though it can be frustrating, you will need to communicate with your bank as you make a decision regarding trying to do a short sale or to let your home go into foreclosure. This will let you know that you tried to work out a solution and that you did not just give up on the home. Help! I Can't Afford My Car Payments!